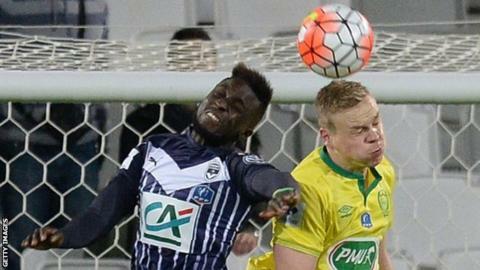 Senegal international defender Lamine Sane has been suspended indefinitely by his club Bordeaux, along with goalkeeper Jerome Prior. Bordeaux said there had been a "serious incident in the dressing room" after the club's 4-3 extra-time loss to Nantes in the French Cup on Wednesday. The French club added they "would make no further comment on the matter". Sane joined Bordeaux in 2009 but sought a transfer in January and the ban could now end his career with the club.